The audio and video were a bit off on the MLB Network's simulcast, but you can get the general idea. Nothing that groundbreaking was said, but it still might be worth a viewing. Basically, A-Rod is still sorry, he got the drugs from his cousin and took them two times a month and he plans to work with an organization founded by a father who lost his kid to steroids. Here's the beginning of the press conference, when A-Rod issued his statement. There were a handful of good questions from the reporters on-hand in the next 30 minutes or so, and I'll try to add those in once I go through them all. 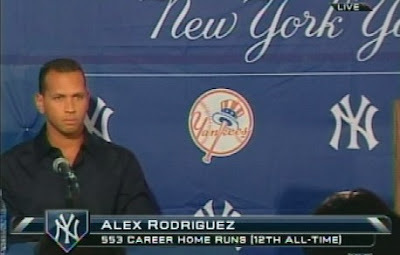 This whole A-Rod press conference was nothing more than a sharade. He came across toay even more of a froud than he did in that puff interview hhe did with Peter Gamaons. In today' press conference he answerd nothing and while he was at it, he threw his cossin under the bus. What a jerk he is. Sportsfan that is ignorant and can't spell, would you rather have had him deny everything? Everyone wants these steroid users to admit what they did and now that one of them is, it's not good enough. I'm sorry for those spelling mistakes in my post yesterday, okay. The point of the post was, that the whole press conference yesterday wad a charade. The reason why he called that press conference according to him was, to come clean be honest. Well, in my opinion he did niehter. When he was asked specific questions about his use he gave the same dopey answer, "I was 24-25 and stupid" A-Rod pleade, when you are 24 or 25 years old, you are a grown men. And you should know by then waht's right and wrong. He came across to me as a lying phony. He may have been lying... but he sure as hell was for more honest and detailed than ANYONE who has been busted so far. That's saying something, the reason why he is getting so much "Is he lying?" flak is because he is Alex Rodriguez. Anyone else (sans Barry Bonds) and everybody would be talking about how honest he is, and how great it is for someone to just come out and say exactly what they did.